In my review of the first season of Iron Fist, I concluded by saying that the series was disappointing, but “I don’t expect that he’ll get in the way” of The Defenders. Silly me. Of course he got in the way. The Defenders does an excellent job of bringing together the various plot threads of past series, particularly the groundwork laid in the second season of Daredevil. That big ol’ pit that Elektra and Matt found in Hell’s Kitchen? Answered. What they did with Elektra’s body at the end of the season? Resolved – and to the shock of absolutely nobody who was paying attention, she reemerges rather promptly in the beginning of The Defenders. What the Hand is really after – not to mention their origins, and the reach of their empire’s tentacles – also becomes clear over time. In fairness, the series is very much worth watching, whether or not you caught any of the series that laid the groundwork in preparation for it. Or especially if you did watch any of the preceding material. Once you see Krysten Ritter’s catty, misanthropic Jessica Jones on screen, you realize just how much you missed her, and how much you’re already looking forward to her second season. While the release of Luke Cage from prison was entirely predictable at the end of the titular hero’s first season, it’s still almost with a sigh of relief: finally, he’s going to be back on the street! The supporting cast we saw from the earlier series are rather numerous – Foggy, Karen, Jeri, et al – but the writers were probably about as effective as could be expected in balancing their screen time and contributions to keep the plot moving along. And then, finally, we see all four heroes on the screen simultaneously. And it’s absolutely a treat. The fight scenes are a bit choppier than what you’ll find in Daredevil, but still very entertaining. But try as it might, the series still suffers from a critical flaw: its plot still fundamentally runs through Danny Rand. And the miscasting of Finn Jones – starry-eyed, idealistic, childlike, but supposedly still a deadly kung fu warrior – is an unavoidable roadblock throughout the miniseries. You can’t help but wonder what might have been had his role been in the hands of somebody more credible. At the end of eight episodes of The Defenders, I couldn’t help but feel that the series, while worth watching once, was just a bit overhyped. It was good, but it simply didn’t quite live up to its potential. And honestly, I was left a bit worried. The Marvel series on Netflix have been, overall, so exceptional. After two straight disappointments, was this juggernaut running out of steam? First up, one must give proper credit to Netflix for its marketing prowess around this series. Not announcing a release date in advance, but forcing the fan base to just wait it out? Kind of cruel, yes, but not a bad idea to deliberately gin up some uncertainty and even instability around a hotly anticipated series. I can definitely appreciate io9’s critical take around their email announcement, but props to Netflix for a risky move associated with the series. Because when The Punisher finally appeared, it was most definitely worth the wait. 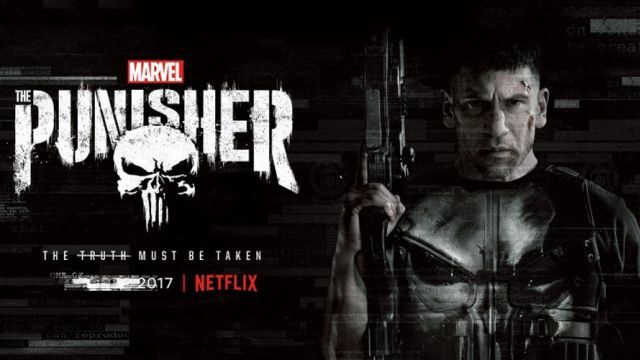 While other Netflix Marvel offerings are a bit slow off the line, The Punisher gets right to it: Frank Castle drops four guys – one of them with his bare hands – before the opening credits roll on the first episode. But he’s not on the nonstop rampage we saw in Daredevil season two, at least not at first. Frank is simply trying to live under the radar – working under an assumed identity at a New York construction site – while he copes with the hell of his unending sorrow at the loss of his wife and children. Of course, that solitary existence lasts for a matter of nanoseconds: hacker Micro, played admirably by Ebon Moss-Bachrach, tracks him down; against formidable odds (mostly due to Frank’s permanent state of derangement), the two form an alliance that is at best unsteady as they pursue the g-men who tried to kill them both. And make no mistake, Jon Bernthal’s Frank Castle is deranged. He’s equal parts Rambo and Jason Bourne, with his character making either of those predecessors perfectly sane and well-adjusted by comparison. Bernthal’s Castle has been so psychologically hollowed out that you are forced to conclude that he ceased to be entirely human sometime back. Honestly, the guy doesn’t ever really speak, exactly: guttural and primal, he snarls, grunts, bellows and roars. While numerous flashbacks and dream sequences help the viewer appreciate why he is the way he is, any thinking person would find his methods at least somewhat morally objectionable. At certain points, even Micro seems to question whether partnering up with Frank was really a good idea. For a quintessential antihero, you could do a whole lot worse. The writers did a stellar job taking the original comic book material and updating it for a post-9/11 world, and as a result, the series offers a little of everything to both please and annoy political conservatives and liberals in relatively equal measure. Shadowy elements in American intelligence spying on American civilians and profiting from war? Check! Gun-grabbing liberal wussies getting a taste of their own medicine? Check! Elements of the American veteran community both struggling to come back from war and engaging in a little stolen valor? Check and check! One walks away with a reminder that the U.S. is home to true heroes, and is not without a few sins of its own. The supporting cast is superb. Amber Rose Revah is excellent as the idealistic Homeland Security agent obsessed with tracking down the truth around the Kandahar heroin smuggling operation that brought about the deaths of Castle’s wife and children. 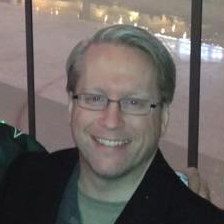 Paul Schulze is entirely credible as the sociopathic CIA operative mastermind. Ben Barnes is creepy and devilish as Frank’s Marine buddy Billy Russo, even when he fairly predictably betrays Castle and is lined up to become Jigsaw, the Punisher’s archenemy in season two. But the real standout? Deborah Ann Woll as Karen Page. She does much more than merely reprise her role from Daredevil and The Defenders, as Karen takes on even greater importance throughout this series. (Why isn’t Woll seriously in the conversation for an Emmy for Best Supporting Actress?) When the dust settles, she represents the conflict that the viewer should have towards Frank Castle: however much she cares for him – and she is unquestionably his biggest cheerleader in the series – she passionately disagrees with his methods. 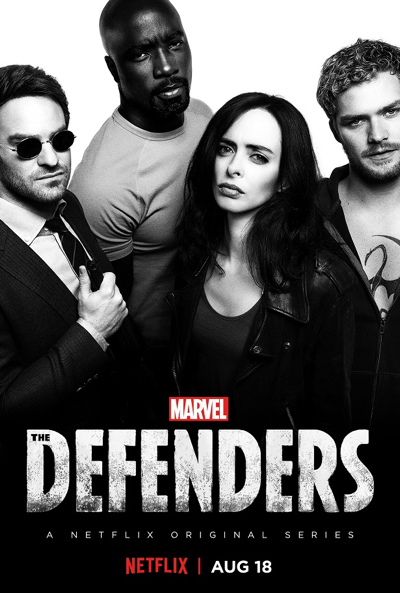 In short: I haven’t watched The Defenders since the first time I binged it on its opening weekend. 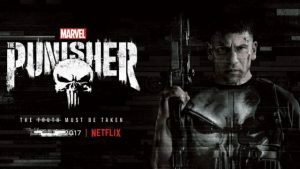 I’ve watched The Punisher from beginning to end two or three times, and individual episodes on other occasions. 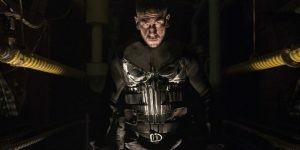 The Punisher definitely helped the Marvel series on Netflix reassert itself as some of the finest shows you’ll see on streaming media. So what’s it going to be, Netflix? More of what made The Punisher great, or what dragged down The Defenders?